The adoption of electric vehicles (EV) has to be complemented with the right charging infrastructure roll-out. This infrastructure is already in place in many cities throughout the main markets of China, EU and USA. Public policies are both taken at regional and/or at a city level targeting both EV adoption, but also charging infrastructure management. A growing trend is the increasing idle time over the years (time an EV is connected without charging), which directly impacts on the sizing of the infrastructure, hence its cost or availability. Such a phenomenon can be regarded as an opportunity but may very well undermine the same initiatives being taken to promote adoption; in any case it must be measured, studied, and managed. The time an EV takes to charge depends on its initial/final state of charge (SOC) and the power being supplied to it. The problem however is to estimate the time the EV remains parked after charging (idle time), as it depends on many factors which simple statistical analysis cannot tackle. In this study we apply supervised machine learning to a dataset from the Netherlands and analyze three regression algorithms, Random Forest, Gradient Boosting and XGBoost, identifying the most accurate one and main influencing parameters. 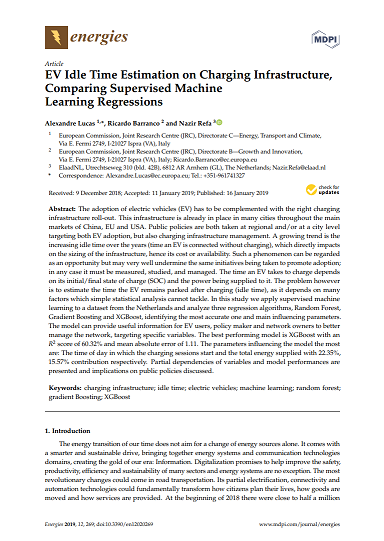 The model can provide useful information for EV users, policy maker and network owners to better manage the network, targeting specific variables. The best performing model is XGBoost with an R2 score of 60.32% and mean absolute error of 1.11. The parameters influencing the model the most are: The time of day in which the charging sessions start and the total energy supplied with 22.35%, 15.57% contribution respectively. Partial dependencies of variables and model performances are presented and implications on public policies discussed.